Free Shipping Included! Yoffi Spread Box | Premium Jewish Gift Box | 3 Jars of Natural Spreads -Tahini Candied Nut, Halvah & Date Spread | Sweet Gift Box | Holy Land Gifts Israeli Gifts | Kosher Pareve |Vegan by Yoffi at 365 Days Of Kindness. MPN: Spread Box 1. Hurry! Limited time offer. Offer valid only while supplies last. ABOUT YOFFI A family business offers a wide range of the finest, premium Israeli foods and gourmet gifts, all in elegant and modern packaging. A family business offers a wide range of the finest, premium Israeli foods and gourmet gifts, all in elegant and modern packaging. Each of our products is completely natural, containing the authentic taste of the holy land. YOFFI works actively with non-profit organizations to provide work for people with disabilities. All of our products are kosher (pareve) and are incredibly popular amongst vegetarians and vegans. We use only natural ingredients, so there are no added preservatives, food colorings or artificial flavorings. Thanks to YOFFI you and your family can try authentic delicacies that Israeli people have been relishing during holidays, and every day, for generations. Our products will expose you to the flavors of Jerusalem, Galilee, Negev, the dead sea and the rest of the holy land regions. When choosing our suppliers, we prefer family businesses - just like ours. We consciously choose quality over quantity in order to ensure that you will receive the finest flavors of the holy land. DO YOU WANT TO ENSURE YOUR ONGOING CONTENTMENT? If you like our products you can save⊂cscribe and promise yourself ongoing supply with additional permanent discount, as a loyal YOFFI customer. ✅ COMES IN BEAUTIFUL DECORATED PACKAGE - Our Israeli gift basket comes with Vivid and colorful package that will add colors to your kitchen. These gourmet spreads can be a great gift for the Jewish holidays. ✅ FOOD THAT FITS EVERYONE - Yoffi's nature-made spread box includes only natural ingredients and it's vegan friendly. It's a classic Paleo food and it's even kosher and pareve. ✅ WONDERFUL ADDITION TO DIFFERENT TYPES OF FOOD - You can use our halva, tahini & dates as a paste or a spread. It goes perfectly on a piece of bread, toast or even pancake. It is tasty and healthy ingredient for cakes or cookies and it is a great addition for yogurt or a bowl of muesli. ✅ OUR GUARANTEE - YOFFI is committed to the best customer experience. Our clients satisfaction is the most important thing and this is why we always promise you a full refund if you don't like our product, NO QUESTIONS ASKED, So you take no risk by experiencing our products. For every need - Contact us directly and we would love to help. 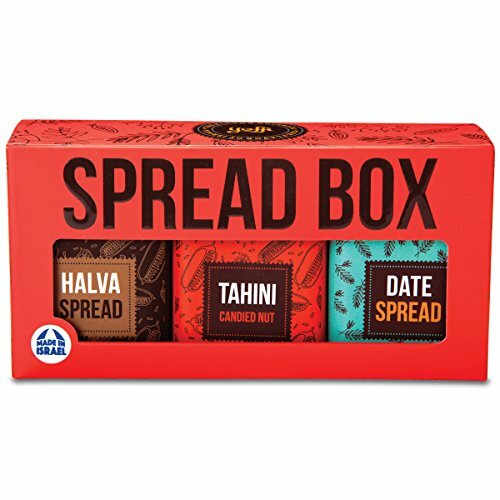 ✅ 3 DIFFERENT SPREADS FOR ANY KIND OF MOOD - All of the three spreads in the set have tahini or date spread as main ingredients but each has its own special exquisite taste. For those who love a little crunch, there is tahini candied nut 6.7 Ounce with chunky caramelized hazelnuts. Halva Spread 7 Ounce - Made according to a family recipe. The spread contains ground sesame seeds with date syrup and honey Date Spread 8.8 Ounce- Fruit rich in vitamins and minerals. All nourishing and luscious! If you have any questions about this product by Yoffi, contact us by completing and submitting the form below. If you are looking for a specif part number, please include it with your message.